Before I get into my submission for this week’s Diva Challenge, I just want to say how much I love Zentangle and the new path it is taking me. I’ve met some wonderful people who share in this passion, as well as new internet “connections” to keep it growing. Thanks to Janet, Rho, Suzanne, Sherry, Patty & Elaine. It’s always fun to get together with you guys! This week’s Challenge gave me a perfect opportunity to “explore” new patterns. With my initials being “SB”, I figured I could always use the usual patterns such as Shattuck or Bales, but I opted to try something different. And, in being different, I decided “no swirls or circles”! I love the organic patterns but I need to expand and try others. 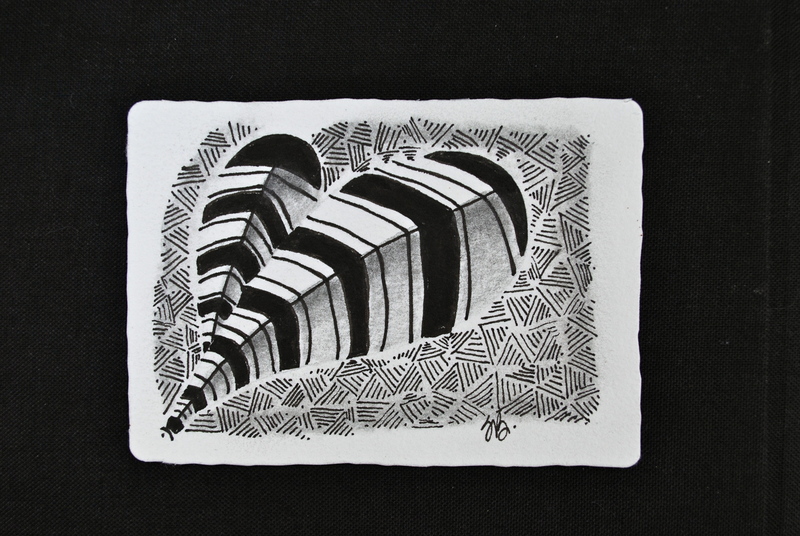 Here is my attempt done on an ATC tile …. Nicely done once again SB !!! and thank you for the compliment. The feeling is mutual. We are enjoying the heck out of this thing called ZENTANGLE. Who would have thought? A very pretty tile, the tangles go very well together. A striking and lovely work of art! Looks great! You would never know that these are tangles you don’t feel comfortable with. Lovely work! Your design makes for a terrific ATC. I like your choice of Patterns. Very effective shading. Nice tile. I like how Swarm surrounds Braze. Very effective to help create some dimension.